The island that you knew as St. Maarten/Martin isn't the same island after Hurricane Irma surged its shores on September 6, 2017 with winds at 180 mph. From structures reduced to salt, new buildings and businesses are already rising to welcome locals and visitors -- nearly 2 million of which come by cruise ship each year. Sint Maarten (Dutch side) and Saint Martin (French side) are used to identity issues. The 37-square-mile island and popular cruise destination shares two distinct governments: 20 square miles is under the sovereignty of France, and the remaining share is Dutch. The separation in government has affected how parts of the island are recovering after the storm, with the intention to come back better and stronger. French president Emmanuel Macron visited St. Martin after Irma and declared that French citizens of the island were culpable, based on the lack of adherence to construction codes. Now, ensuring that structures will be more resistant to damage is taking time, but the stricter building codes are seen as an investment in the future. So while the French side seems to be coming back more slowly than the Dutch, it's an intentional and methodical timeline. Still, beloved Orient Bay is making a comeback; a gorgeous beach club on Bikini Beach reopened in mid-July. The lolos (local restaurants) are open, in between the larger restaurants along Grand Case that remain closed. Surprising oases exist -- new or completely renovated resorts, restaurants and attractions -- among the roadsides where crushed cars and partially sunken boats still dot the landscape. According to Gabriel Amado, president of the United Tour Operators Foundation, this upcoming winter cruise season isn't just back to normal, it's better than previous seasons. "It's actually not taking a long time to come back, it's back already; and it's more than it was before." Stops on an island tour might not be the same as before (and certainly don't look the same), but while Marigot, capital of the French side, recovers, cruisers on a trolley tour or double-decker bus might experience gems like a small handcrafted rum distillery or a gelateria inside a vintage carousel. "People wanted to see how things were even on the first calls," Amado says, remarking on cruiser curiosity. "When people came back four months after, there's damage but it's clean and safe." Amado remarked that word of mouth and the reviews people posted online actually brought more people to the island. 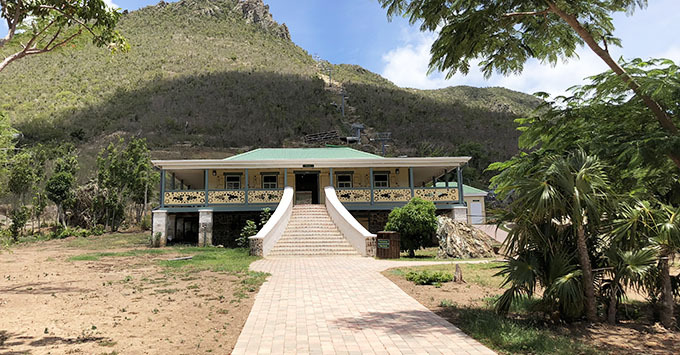 One place that's been open since the end of 2017 is Rainforest Adventures, a new eco-park on a historic estate outside of Philipsburg. 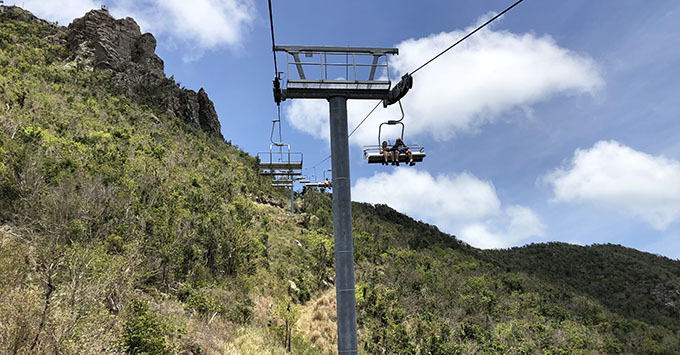 The sustainability-focused brand, which can be found in other locations like St. Lucia and Costa Rica, was contacted years ago by Carnival Cruise Line to develop a must-see attraction in St. Maarten/Martin. After years of permits and development, the park was two weeks away from its grand opening when Irma hit. Within an astonishing two months, however, employees got the park ready to open -- and they finally did in late November. Attractions include a scenic chairlift called the Sky Explorer, a zipline course, the Schooner tube ride and the crown jewel: the world's steepest zipline, known as the Flying Dutchman. Way more pleasant than terrifying, the Flying Dutchman is a seated zipline that allows riders to glide down at 60 mph into spectacular views of the island on either side. An appreciation for the island, and its history, is apparent for visitors who visit the small museum on the grounds. Housed in a lovingly restored sugarcane boiling house, the restaurant, Emilio's, is a far cry from the fast-food venues most Americans are used to at amusement parks, with a classically trained local chef, restaurant managers and sommelier (yes, you read that correctly) well-versed in the industry. "It's good to have these types of parks that can embrace [a large] quantity of people" Amado says. Especially as St. Maarten/Martin explores the possibility of bringing in more ships and passengers, Amado notes that the island needs to maintain more attractions or a greater capacity on existing tours and attractions. Only a handful of tours in St.Maarten/Martin aren't back up; these include an America's Cup-style regatta, a dolphin excursion in Anguilla and a butterfly farm. But prospects are still better than ever for the coming cruise seasons -- for local tour operators and cruisers looking for choice. Compared with some other islands in the Caribbean, St. Maarten has the ability to thrive with a unique challenge: some passengers are booking not one but two tours in port during a single day. While Amado usually tries to bring something new into the mix every year, this year was focused on getting equipment back up and running, and improving his company's existing tours. He's already invested in a brand-new tour bus for next season, and is not worried about filling it. "We probably won't even wait to debut it until next season; I know as soon as it's ready, we'll sell it because cruise lines are already requesting more capacity." 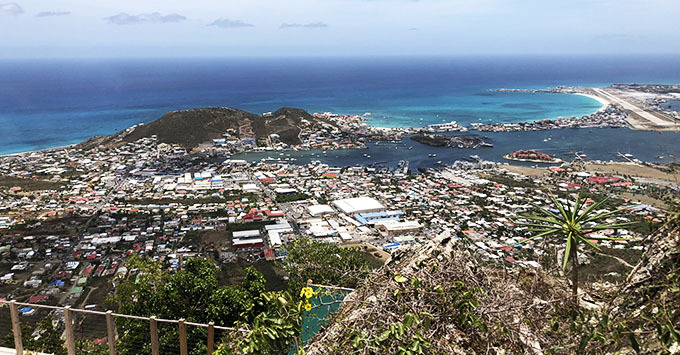 When we let readers know we were heading out on a tour of some Caribbean islands affected by the hurricanes, the most common questions we received were about specific beaches or restaurants -- and this was especially so for St. Maarten/Martin. It's not a surprise that beach excursions are among the most popular, especially to the French side of the island where Orient Bay is located. "The beach is easy," Amado says. "You're on vacation, you want to relax. Where do you go? The beach." Orient Bay is technically open, but within the 2-mile stretch cruisers will find markedly different experiences. Club Orient, a spot frequented by cruisers, has posted "open" signs. But while colorful beach umbrellas line an idyllic shoreline, facilities include a temporary shack for drinks and snacks, and not a lot else (for now). 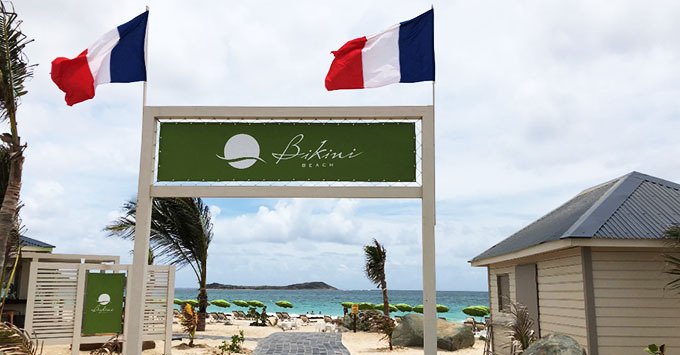 In mid-July, Bikini Beach reopened with a bar, restaurant and gorgeous seating areas among the swaying palms that offer hanging basket chairs or lime-colored padded beach loungers. Definitions of what a beach entails vary, and those expectations could be the difference between a day at the beach now, and a day in the sun before Hurricane Irma. The physical elements of a beach are back, but the concessions aren't. "Even though it's an island with plenty of beaches, there are standards we have to maintain for a cruise tour," Amado says. "Mullet Bay is lovely, but there are no bathrooms, so we can't bring cruise ship guests there." Tour companies did take measures to make experiences in port more comfortable for beach-seeking cruise passengers. Temporarily, restrooms intended for the new homeport facility at the cruise terminal (which was destroyed) have been moved to Kimsha Beach. Bars and restaurants like Captain D's Rib Shack are right out front, which provide the local drinks and eats that make a beach day complete for many cruisers. 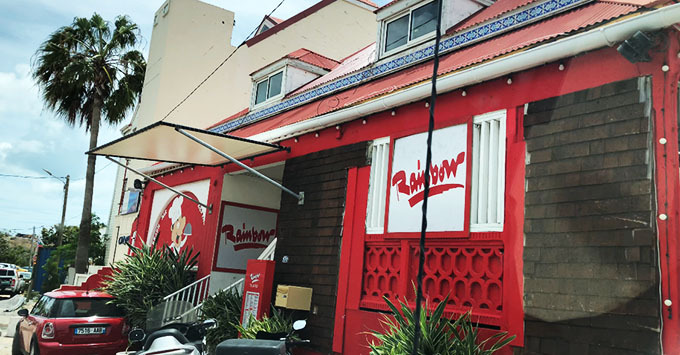 There are sunny spots among the remaining restaurants -- cruiser and local favorite Rainbow Cafe, in Grand Case, is not only back, but many say better than ever before. A location of Zee Best bakery has reopened in town, but its other location is still shuttered. Loterie Farm, a swanky eco sanctuary and restaurant nestled in an isolated valley, appears as a tempting mirage with young and beautiful sunbathers soaking in the surrounds -- hidden behind a facade of roadwork and past a bathroom with the walls blown off. The Sunset Bar & Grill, at Maho Beach, has opened in increments. 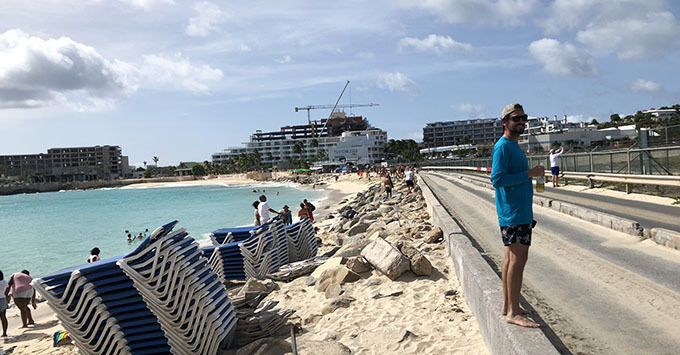 A large bar and seating area is open to the steady stream of tourists who flock here to watch the planes take off and land on the famous air strip of Princess Juliana International Airport. But construction continues as the property builds a new stage, fixes sidewalks. Huge rocks washed up on the beach during the storm, and while removal is scheduled for any day now, the boulders haven't prevented beachgoers and plane-watchers from finding a patch of sand or putting their backs in the sea while these massive jets bring in new and returning visitors to an island well on its way to recovery.